The Ashes, as 130 years of history might suggest, is all about tradition. But, as Kevin Pietersen reflected in the unfamiliar surroundings of the Welsh National Cricket Centre in Cardiff, from time to time as a player, it doesn't hurt to divorce yourself from the excitement. Though it might be stretching a point to suggest that Pietersen is happy to be playing the most anticipated cricket contest of the year at a venue where England have previously contested a mere three overs of an incomplete ODI, he is nevertheless ready, in that old sporting cliché, to take the positives out of the situation. 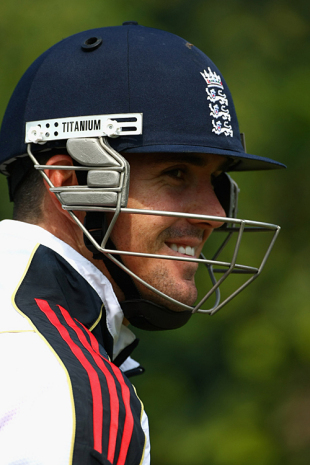 "As a cricketer, you obviously know what's going on and understand the rivalry [of the Ashes]," said Pietersen. "But if you try and make it out as something bigger than it is, you can hurt yourself and get into a bit of a tizzy, and add too much pressure on yourself. "At the end of the day it's a game of cricket, between two teams who want to win, just the same as India, South Africa, or anyone. The simpler you try to keep each game, each session, each ball, the better you are, and the more equipped you are for success." As a consequence, it could be taken as something of a blessing for England to have decamped to a venue lacking the grandeur of Lord's - where Australia, famously, have not lost since 1934 - or the memories (ancient and more modern) of Edgbaston, Headingley or The Oval. But as far as Pietersen's gameplan is concerned, history is bunk anyway - especially where his contrasting experiences in 2005 and 2006-07 are concerned. "I look back at history and take what's happened in the past in a positive way," he said. "I also take the negative stuff and try to turn it into positives to make it work for the team, as well as myself obviously. I'll be motivated in a lot of different ways by what the Aussies have to throw at us this summer." It was pouring with rain when England arrived for their practice session at Cardiff, much as it had done last September during their aborted ODI against South Africa, and though the weather cleared up beautifully as the afternoon wore on, it was precisely the sort of downpour designed to put a dampener, literal and metaphorical, on the build-up to the contest. "We haven't been lucky enough to see much at all today because of this weather, but I'm very happy to be here in Cardiff," said Michael Clarke. "It's a wonderful place to play cricket. I've been fortunate enough to play here a few years ago when I was with Hampshire, but it doesn't really bother me at the end of the day. It's up to the English cricket board to work out where we play and this is the ground we're playing our first Test match on," he added. "It doesn't matter where we play, we just want to get off to a good start. At the moment the covers are on, but I think tomorrow will be a pretty important day for us to come down and look at conditions. Hopefully there'll be a bit of sunshine so we can see the wicket." When the pitch did finally emerge from beneath its covers, there was an undoubted green tinge to the surface, although with two lawnmowers working in tandem, there's still time for that grassy covering to have been obliterated come Wednesday morning. Either way, Pietersen is confident that a small corner of Wales will have become an extension of England by then, and if his team-mates had needed convincing of the ability of the Welsh public to cheer on sides other than their own, then the recently concluded Lions rugby tour of South Africa provided timely reassurance. "In the last three weeks, our boys have seen how much support the Lions got in those Test matches in South Africa, and so we understand and know that the support here for us will be the same singing and cheering and carrying on like the Lions got," he said. "It brings a smile to our face, and we are looking forward to putting on a really positive performance for the Welsh public. We know how sports-mad they are, and they will be right behind us." Few players will cause a greater frisson of anticipation when they walk out to bat than Pietersen, although he did his best to shrug off the hype that surrounds his return to Ashes action. "You guys make the weight of expectation a lot greater than it actually is," he said. "In the dressing room I'm just as important as anyone else. There is no great expectation on me. "A lot is written, and there's a lot of verbal stuff from outside the [dressing] rooms, but if you look at the stats over the last 12 months, [Andrew] Strauss has got hundreds, [Alastair] Cook is turning fifties to hundreds, Colly's got hundreds, Bopara has got three in a row. Matt Prior's got runs. It's not as big an issue as everyone says. I have confidence in the dressing room. If you get me out cheap or if I have a bad series, I truly believe that the guys will perform and England will win." As far as Australia's prospects are concerned, Pietersen was wary of reading too much into reports of Brett Lee's impending absence from the first two Tests, but he nevertheless admitted that without players of the stature of Shane Warne and Adam Gilchrist in their ranks, they were bound to lack some of their aura of previous series. "Any team that loses Warne, McGrath, Hayden, Langer, Gilchrist, Damien Martyn, is not going to be as strong, because those guys are as close to legends of the game as you can possibly get, and some are legends of the game," said Pietersen. "They are going to be weakened, but the Australian way is to come out and be fierce, competitive, and dominant in what they do. "They will be forceful in their approach, and throw a lot of punches early in a Test and a series. It doesn't matter who they put out, it's going to be tough for us. We can't talk about who they don't have, because when those guys pull on the baggy green, which is so historic to them, they are a fierce, fierce side. We expect it to be tough, but we'll also come out hard and come out fighting, because we're not scared."